Did you see Part 1 yesterday? Well here’s Part 2 of the MDRP wrap up! Ready? Okay! Let’s eat dessert first! I’ve mentioned before that the whole food deal isn’t really my thing when it comes to parties. I’m a big out-sourcer in this department. 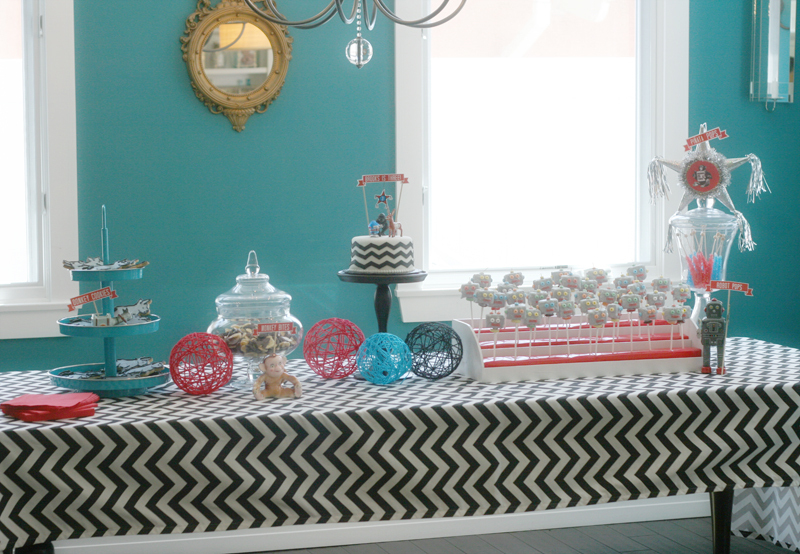 I did have a clear vision when it came to the dessert table though. I wanted each party mascot to have a dessert of it’s own. 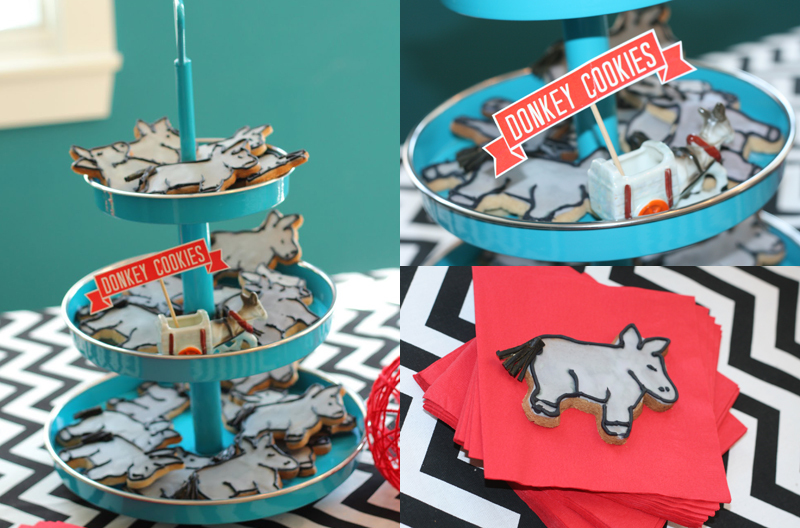 My mom made Donkey Cookies for me. The tails were sliced up licorice whips. 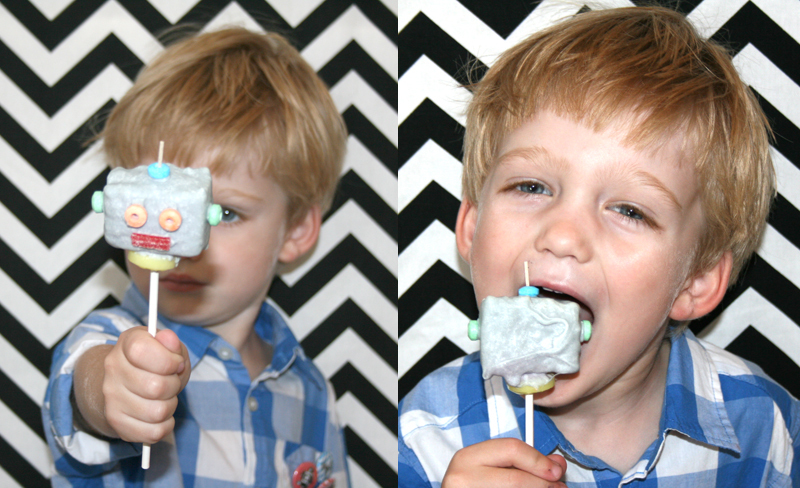 When my son took a bite, he almost got sick! I think he was expecting chocolate, not black licorice! Oops! But how cute are these guys? They were yummy too! 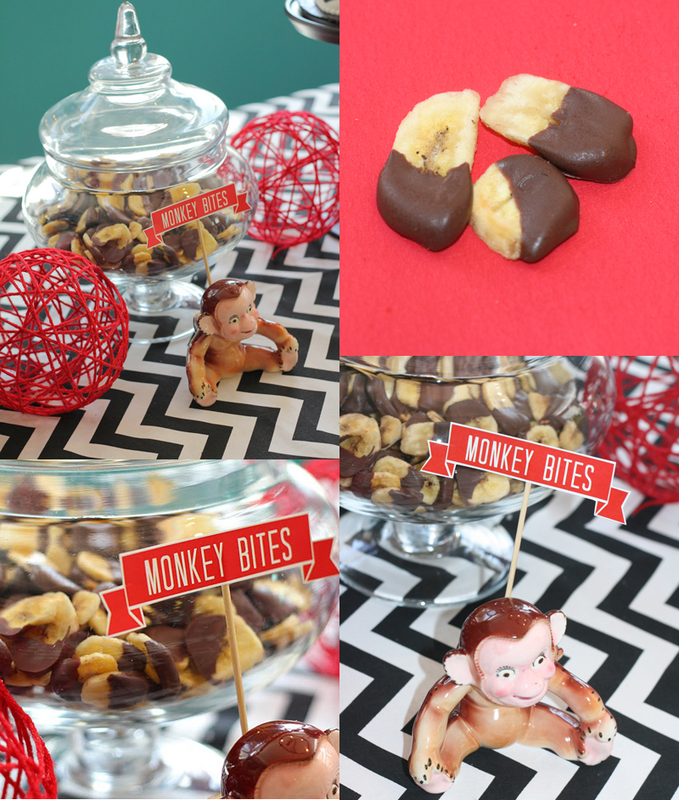 Next up, Monkey Bites! I intended to make chocolate dipped bananas, but again – not really my thing – so instead I went to Trader Joe’s and picked up those dried organic banana chips. Brooks & I dipped them in chocolate and called it a day. It turns out that these were actually really good. People even took snack packs home of these. Who knew? Can’t go wrong with chocolate. 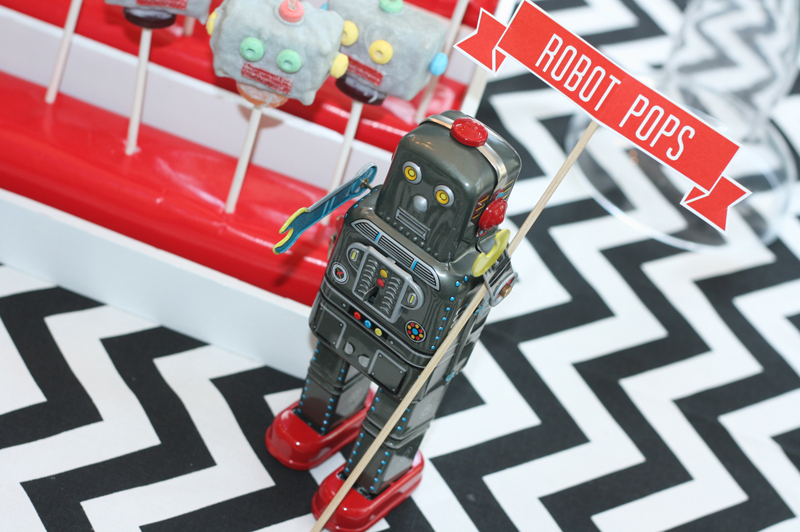 And now for the Pita of the dessert bar… Robot Pops! They turned out pretty cute, but holy cow did they take forever! And I even cheated! 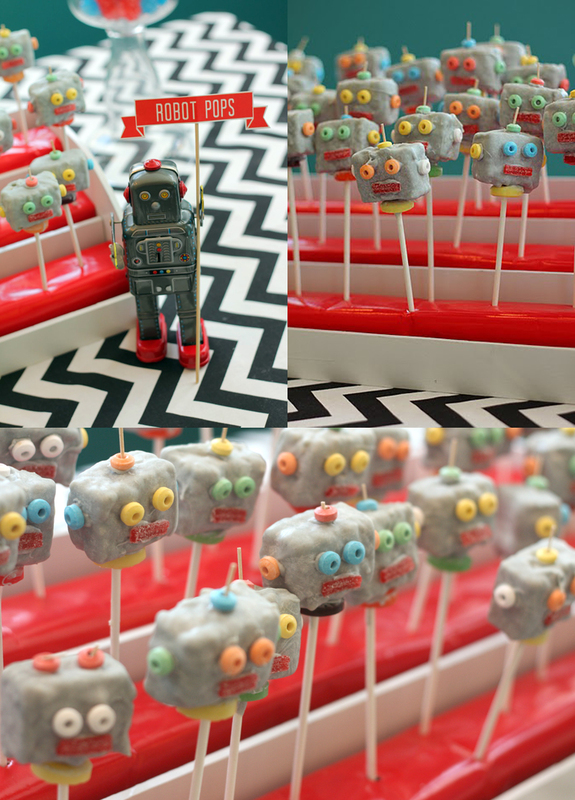 Bakerella has a cake pop cookbook with the robot pop recipe in it. (Thanks to my friend Steph for throwing it my way!) I loved how they looked but honestly didn’t want to go to all the trouble of baking and rolling cake balls. Soooo… I went and bought pre-made rice krispie treats and cut them in half instead of making the heads out of cake. It was pretty sturdy and I felt proud of the time I saved… until I started dipping these suckers into the white (grey) chocolate and decorating the faces. I think it took me 4 hours! I’m either really bad at this stuff or these things are a bonafide Pita. I’ll let you decide! But it was worth it. I loved how they looked. Here’s where I lost some steam. 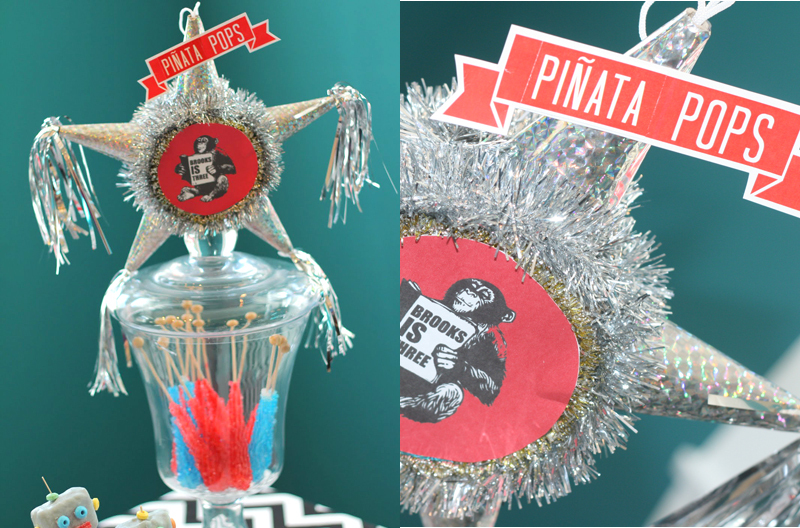 I couldn’t think of anything creative for the piñata portion of the dessert table so I just got a few rock candy sticks and called it a day. I figured there was enough sugar on the table already. I loved how the cake turned out! 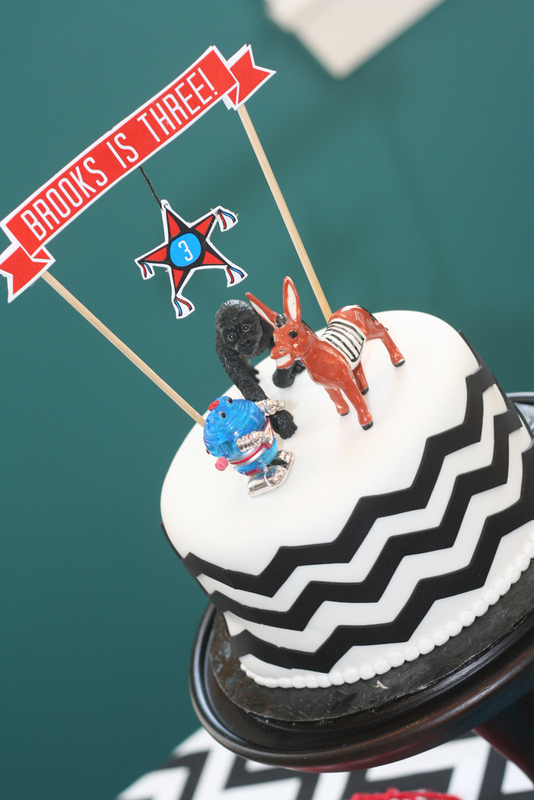 I knew I wouldn’t be able to make what I had in my head actually look good, so I ordered this cute 6″ cake from It’s All About The Cake in Dana Point. 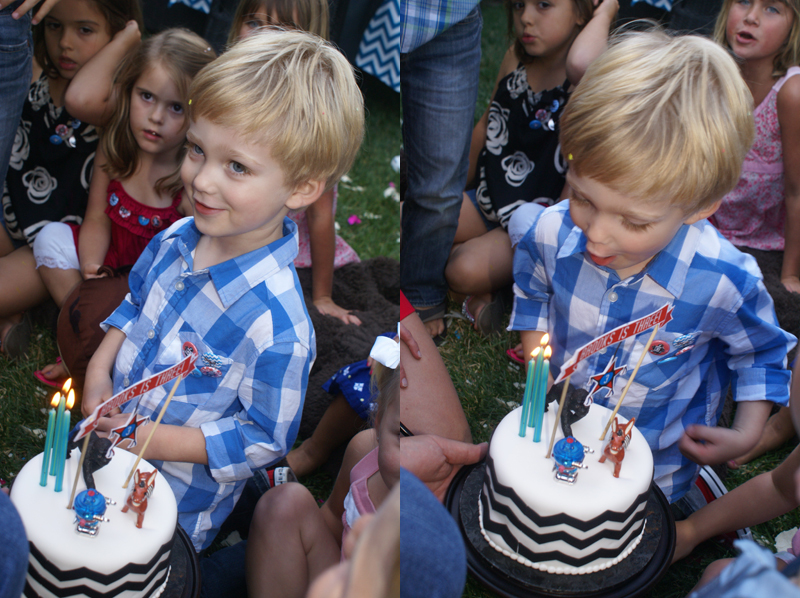 They make incredible and beautiful things and were all about making a chevron cake for me. All I had to do was add the toppers and I think we had a show stopper! It was a pity to eat it! The funny thing was that we didn’t even eat it that night! It’s obviously a teeny cake and there were too many people there to give out slices so we kept it for the next day – which was his actual birthday anyway. Who needs practical when you can have cute? Didn’t matter much anyway – everyone got pretty hopped up on sugar! This guy was no exception! I’m really, really good at dialing out for food and I knew just where to phone for this shindig! Since it was such a random theme, I went with random food. Mexican AND pizza. 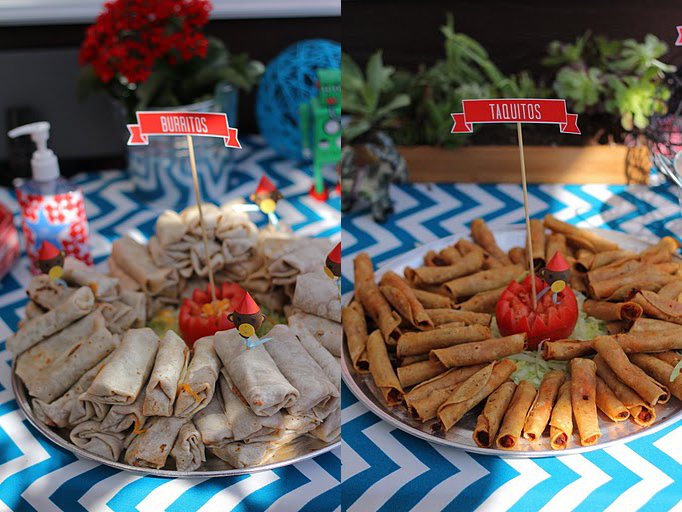 If you’re in SoCal, it doesn’t get much better than Las Golandrinas for kid-friendly Mexican party platters. 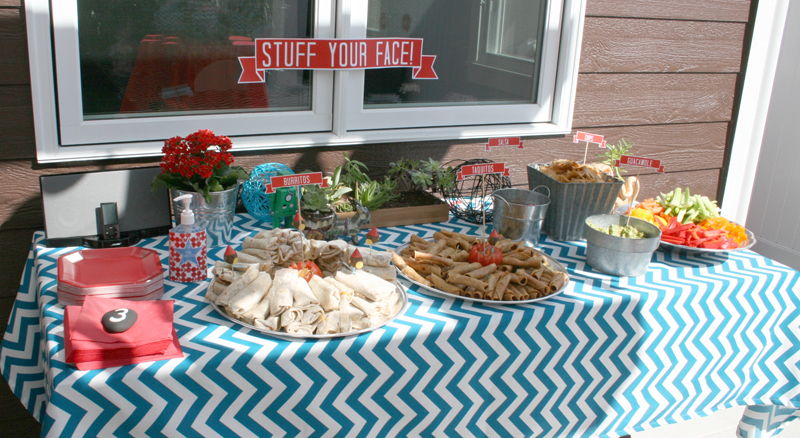 Their mini-burritos are perfect for wee ones and EVERYTHING they make is delish! About an hour into the shebang, we had 10 pizzas delivered from Pizza Hut. Not my go-to pizza place but with their 5 for $5 deal, you really can’t beat it! (Quick side note here: You can order these pizzas online up to 7 days in advance. It was awesome! Suddenly a pizza man showed up at 5:30 and I didn’t have to do a thing! Go Pizza Hut! Who knew?) I also cut up some veggies – whoo hoo! I guess I did do something! It was the perfect amount of food…we did not have a piece of food left. Or maybe that means people went hungry? I don’t know. Oh well. 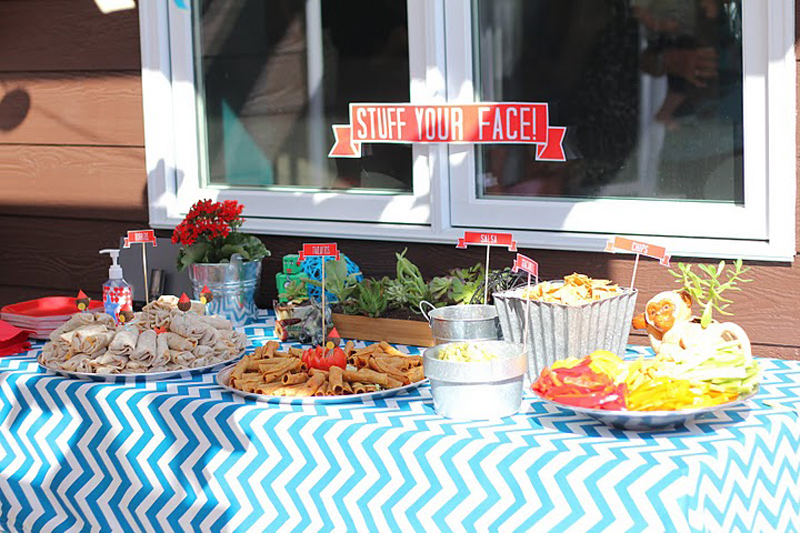 I have to give a quick shout to my friend Steph and sister Ellie who took a ton of incredible photos of this party for me! They’re all jumbled up with mine but chances are, if the picture is good, it’s likely one of theirs. Thanks girls! This post makes me want a salad! Geez. More tomorrow… It’s photobooth day! Thanks for reading! 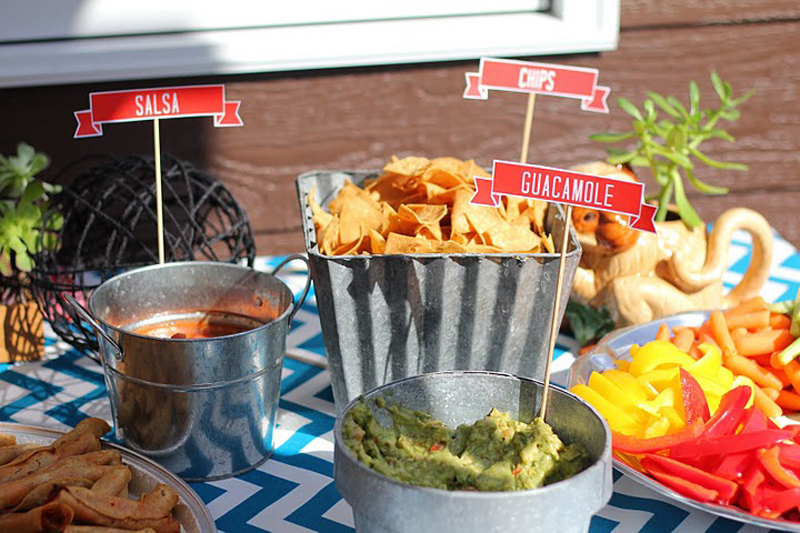 This entry was posted in kid's parties, parties for kiddos and tagged 3rd birthday party, boy's birthday party ideas, donkey party, monkey party, party theme, pinata party, robot party by Annika. Bookmark the permalink. you are AMAZING!!!!!! 🙂 but you had to already have known that, right? Wow – what a shindig! 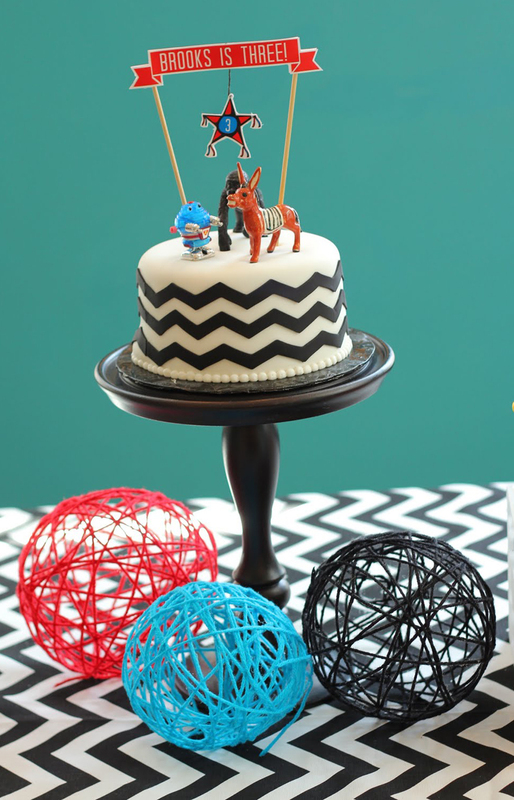 Oh my gosh – your parties are incredible! What a gift you have! 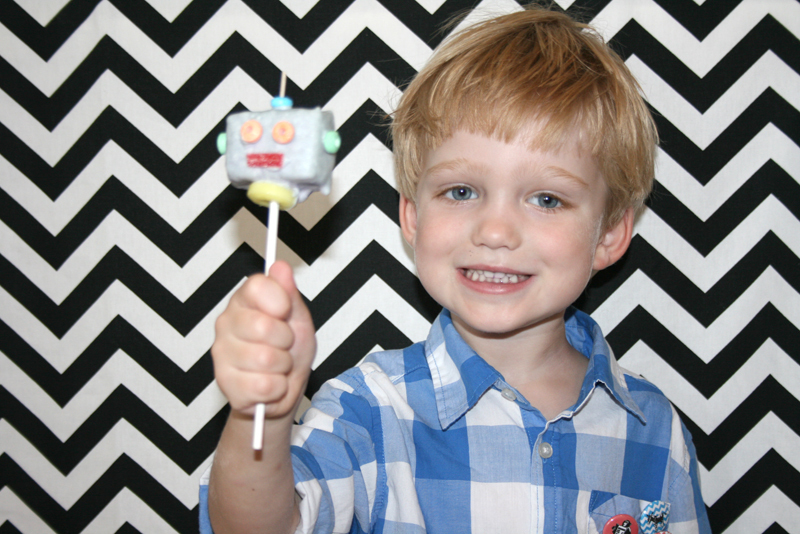 I was googling robot ideas and I found your blog – I’m subscribing 🙂 I have a question about your robot pops (LOVE the idea to use Rice Krispies!) How did you get the candies to stay on? Did you just stick them on before the chocolate hardened or did you use a “glue”?